What would you do with an extra 2 days this year? Would you take a spa getaway? Chill out at home? Sleep? Every year, the average person spends over 2 days looking for stuff – keys, the remote, glasses, cellphone, etc. Make this the year you get organized and reclaim those days. And extra time isn’t the only benefit that comes from decluttering and organizing your home. Did you know that clutter is known to increase cortisol levels? Cortisol is what controls stress levels – so more clutter equals more stress. But it can also have more direct impacts on your health – like less sleep, higher blood pressure, and an increased incidence of depression. There are also social impacts of clutter. Nearly 50%1 of us won’t invite people over if our homes are cluttered. This can increase isolation, which (full circle) can again increase rates of depression. Seems like the weight of clutter is much higher than just the weight of all this extra stuff. So let’s clear the clutter and get a little closer to living our best lives this year. Now isn’t that something worth celebrating? 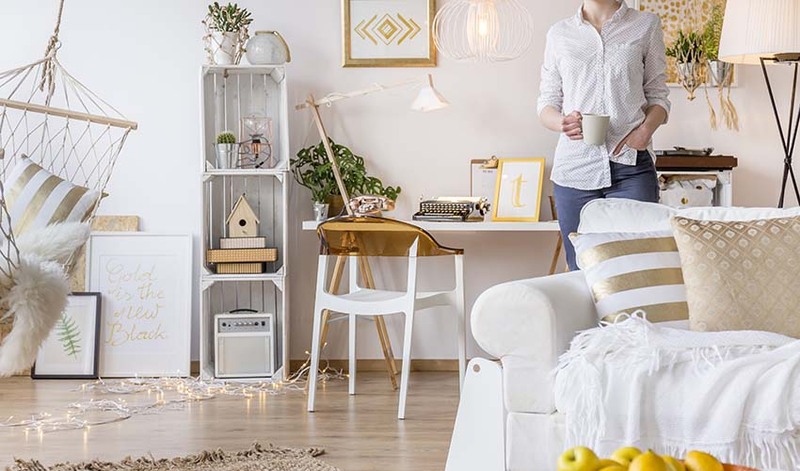 Here are a few ways you can kickstart a tidier new year. Make a mess temporarily – To get started, empty everything out of your closet, and really assess what you need, and what you don’t. Create piles to discard, donate, and keep. And don’t feel guilty about getting rid of stuff because it’s better to rehome it than let it go on being unused. Your less cluttered closet will make mornings easier, you can even consider selling your items online or through consignment and put some money in the bank in the process. Then, repeat throughout your home with every closet, dresser and those mystery boxes in the basement. Think about your daily routine – Group things that you always use together so you can find them in one place. And we’re not just talking about socks and underwear. Umbrella and rain boots, juice glasses and vitamins, and cleaning supplies in a caddy are just a few combos. Give everything a home – Assign a place for everything in your home to live. Baskets, trays, crates and hooks are a great way to help get everything organized and out in the open. Once done, you won’t have to wonder where something is, because it’s exactly where it should be, which can be a great time saver. Banish the junk drawer, closet, cupboard – It seems daunting, we know. But once it’s done, just imagine how freeing it’ll feel to not have to worry about something falling on your head when you open the cupboard door? As you sort through the contents, be really honest with yourself about whether or not you really need it – if you haven’t used it in the past year, you probably don’t need it. Next level organization – Once you’re clutter free, you may start to see the beauty in organized items. A basket of toilet paper can surprisingly make a washroom seem more stylish. A clear container filled with like-coloured bits can look like décor. And books that are organized into a gradient rainbow make a Pinterest-worthy display. Are you ready to kickstart a tidier new year? Just remember that while an organized home is proven to help your mental health, it isn’t a guaranteed anxiety-busting solution. So if you’re feeling a bit down, there’s never any harm in mentioning it to your doctor or talking to professional about it. And with a Blue Cross Health Insurance plan, you can get extended benefits that not only include coverage for routine medical expenses like dental visits or vision care, but can also help cover the cost of therapies like psychologist visits and massages.